In honor of good ol' Tea Towel Tuesday we are doing our first ever giveaway, featuring of course a couple of our favorite tea towels, and some other must-have goodies!!! 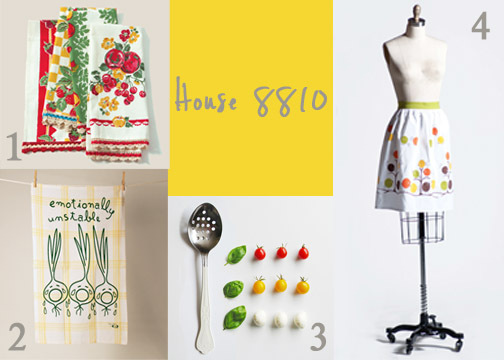 Step 1: Enter our Giveaway: Comment on this post and tell us what your favorite item is on House 8810! **Also, be sure to follow our blog, like us on facebook, or follow us on twitter! It will be great for future promos/giveaways and your soul if you follow us on all social networks :) Also, be sure to tell everyone and anyone about our giveaway! **This is not necessary to win, however it might be good karma for you to have on your side with the random number generator gods! Step 2: That's it you're done! Just enter, cross your fingers, and we will announce the winner NEXT Tea Towel Tuesday (Feb. 15th)! I LOVEEEEE THE WOODEN POST CARDS! I love all of your products! They remind me of a simpler time, a more elegant era. I use my tea towels daily instead of simply hanging or collecting them. Such a treat! love the your the cream in my coffee dish towel. **today** my favorite item is the california table cloth...but that may change momentarily...i absolutely love everything! Sliced bread striped towels or the stamped towels. I'M OBSESSED WITH YOUR SHOP, and well, tea towels in general. LOVE IT ALL! oh my, i have to say - the personal library kit. oh my indeed! I absolutely love everything on this site, so much that it is hard to pick a favorite. I am a huge fan of all the kid's tableware. I also love the grandmas kitchen towels and every single tablecloth! I can't choose between the table saw and the M-cups. So much love! I adore the Swell Everyday Bags!! I follow your blog and on twitter! Really I have to choose one favorite?! It's all my favorite! I love the Shangri La quilts;I keep coming back to those yummy colors! love everything! the read to me alphabet cards would be useful tho. I love it all!!! I love the duck plate set...I just love all the colors in everything and the vintage feel. I love so many things that it's hard to chose my favorite. I love the all of the table linens and the stamped tea towels. I love the Emotionally Unstable Dish Towel! Too funny!! I am in love with the Pizza Boss 3000 it is so adorable. I would seriously make pizza everyday just to use it. I think I love the Cottage Rose Throw ... but I have to say, I love almost EVERYthing you have! ...now... off to tweet about your giveaway. 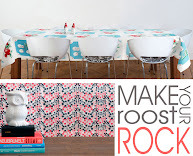 Oh my goodness, the Liberty Table Cloth is just lovely! I love the paper dollies! I love every single product! eeeeeep! but, tonight I will say my fave is the "little lamb" plate/cup. Flea Market throw among other things...just blogged about my super-crush on House 8810. I love it all, especially the BBQ grill! I love so many things, but the very berry tablecloth is my fav. One lucky winner will win a $500 VISA Gift Card sponsored by Yipees.com!